If a startup wants investors, mentors and a supportive community -- but not the expensive costs of a major city -- Boulder is the place to be. Entrepreneurs there say the city, which borders the Rocky Mountains just northwest of Denver, has all the benefits of Silicon Valley. It has a developed software industry that began to grow in the mid-1990s. Well-educated types are drawn to its prestigious research institutions, like the National Center for Atmospheric Research. And the entrepreneurial spirit has long been present: The natural foods industry was practically born there. The city has since become a hub for green tech. 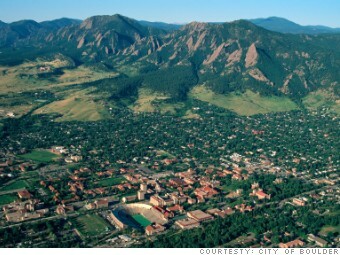 Fewer than 300,000 people live near Boulder, but it draws more venture capital than cities many times its size. What really makes Boulder stand out, though, is its proven startup development program: TechStars. Many refer to it as the best in the country, and the program claims strong stats to back that up. Since it began in 2007, the program has helped 65 startups reach $115 million in funding. All but 8 were acquired by other companies or remain active.